First, my thanks to Cinabar over at Foodstuff Finds. She and I have recently done a candy exchange, and this is the first in the plethora of great British candy she sent me. 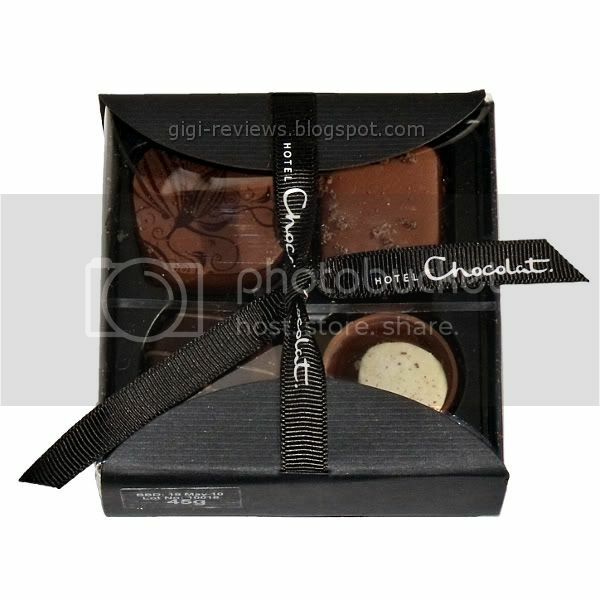 I started with this item because I simply do not get enough Hotel Chocolat in my day-to-day life...and Jim is always sending me into chocolate envy with his. 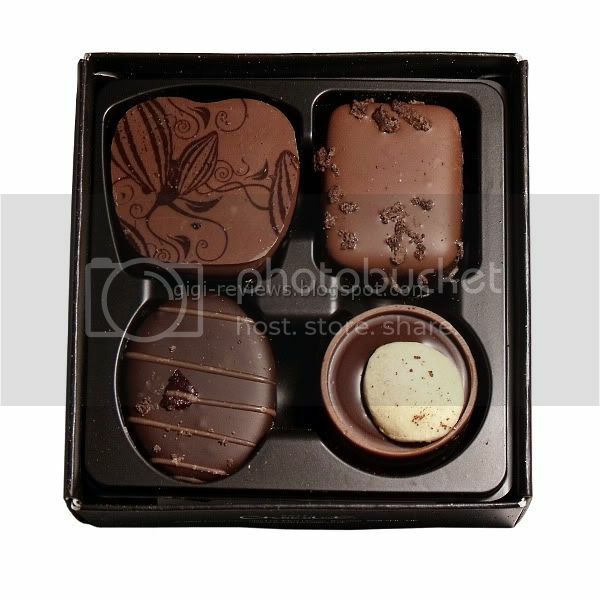 This four piece collection has some beautiful filled pieces. 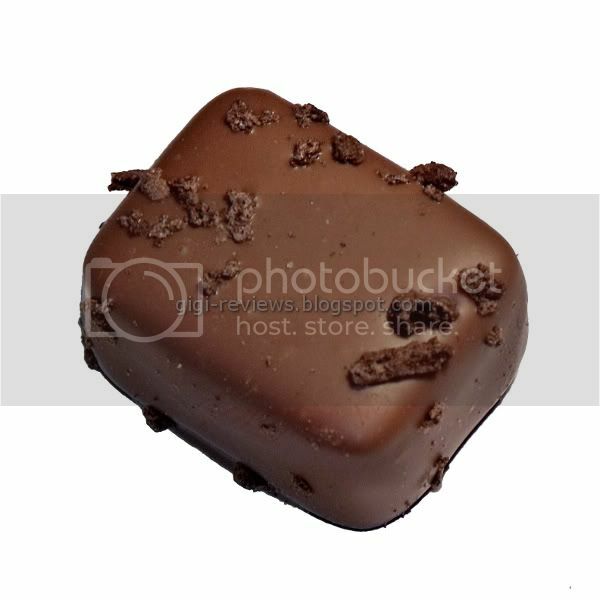 The outside of this cube is studded with little brownie crumbs. The center creme looks smooth -- except there are little tiny brownie crumbs mixed in. The smell is sweet and milky. Biting into the piece, it's surprisingly crunchy...that was a nice surprise. It didn't remind me much of brownie in any way, but it has a really nice and mellow milk chocolate flavor. And the crunchies mixed in with the super-smooth center is fabulous. I had to Google "Amarena Cherry" to find out if it was something special. And as best I can tell, it is like a really upscale Maraschino cherry. Basically, if the two were different branches of the Griswold family tree, the Maraschinos might be like Cousin Eddie emptying his septic tank into your yard, while the Amarenas are more like Clark's uppity mother-in-law wondering what the hell Ellen ever saw in him (and possibly why her grandkids looked different every time we saw them). The smell of this piece reminded me a lot of a cherry brandy. Rich, and just a little boozy. 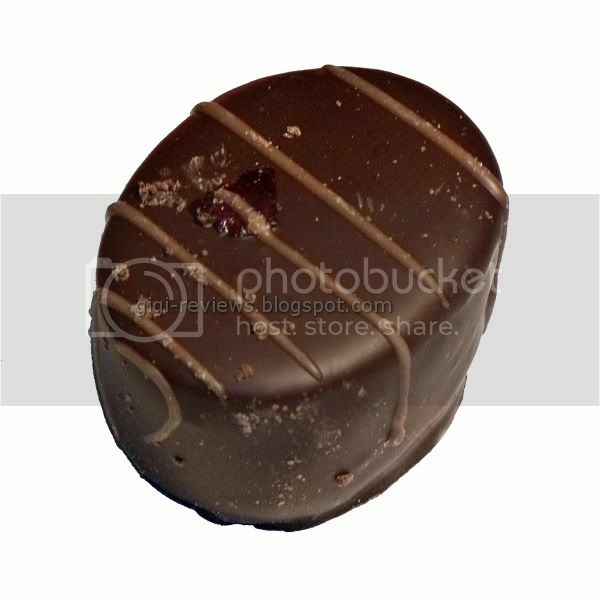 The dark chocolate outer shell is deep and biter. It's like coffee, only not a strong mocha. 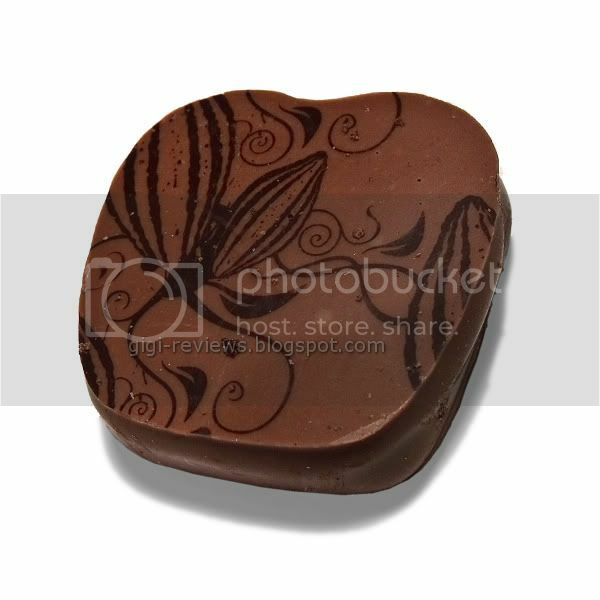 The bitterness of the chocolate is perfect because the buttercream center is very sweet. 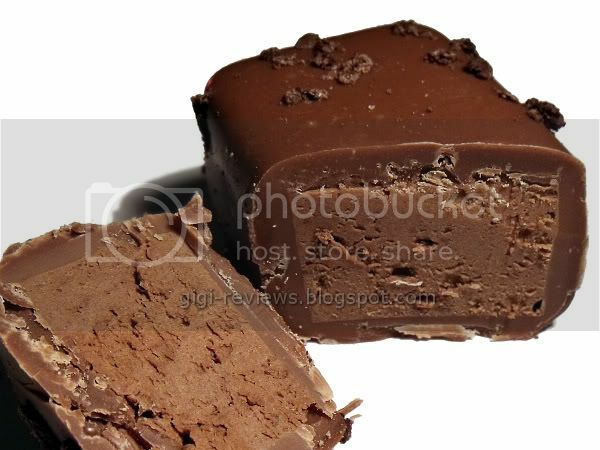 With a milder, milky chocolate it would have been too sweet overall, but the dark chocolate really adds to the appeal. Sadly, I have a love/hate relationship with the buttercream filling. Texture-wise, it is the most incredibly smooth buttercream I have ever had. There is no sugary, graininess to it. It's silky smooth enough that The Zohan might give up hummus for it. The only issue is that the flavor -- though supposed to be Amaretto -- reminded me of cheap cherry cough syrup. And it's really hard to come back from cheap cherry cough syrup. The inner cherry was quite small -- about the size of a plump blueberry -- and oddly, while the creme around it made me think of cold medicine, the cherry itself didn't. It was tart and juicy with just a tinge of sweetness. I could eat these by the handful. This was a cute candy. 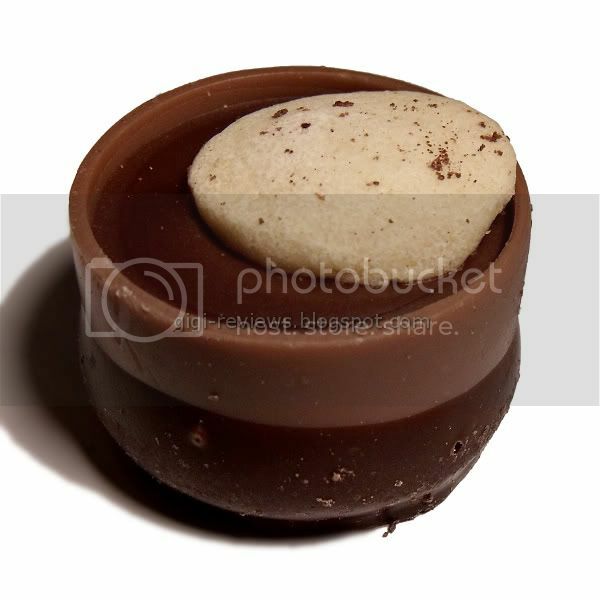 I loved how the tiny little biscuit sat atop the molded chocolate cup. I have noticed that "butterscotch" and "caramel" can sometimes be interchangeable in British candy. 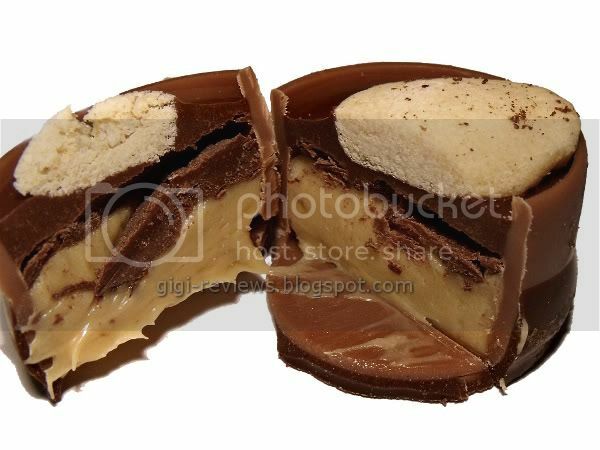 Here in the US, the flavor we expect of butterscotch is like that of butterscotch puddings or Werther's candy. 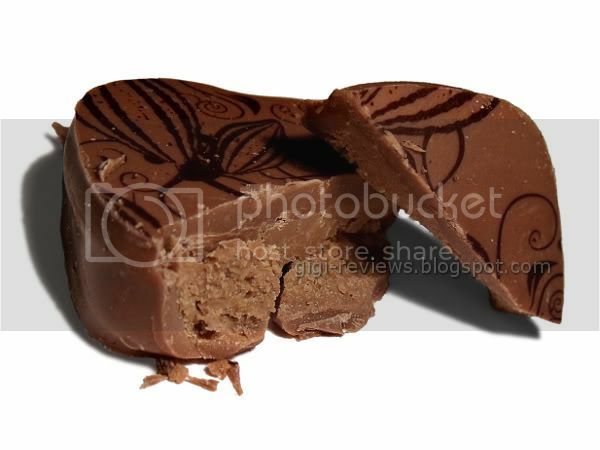 But sometimes what is described on a UK product as butterscocth flavored is more like what we would call caramel flavored here. In the strictest sense, butterscotch is a basically caramel that's made with brown sugar and butter in place of "plain" white sugar and butter. The butterscotch in this piece was the Werther's type -- only it was whipped into an almost fluid state. Again, high praise for the texture. The butterscotch has a very brown sugar taste to it. 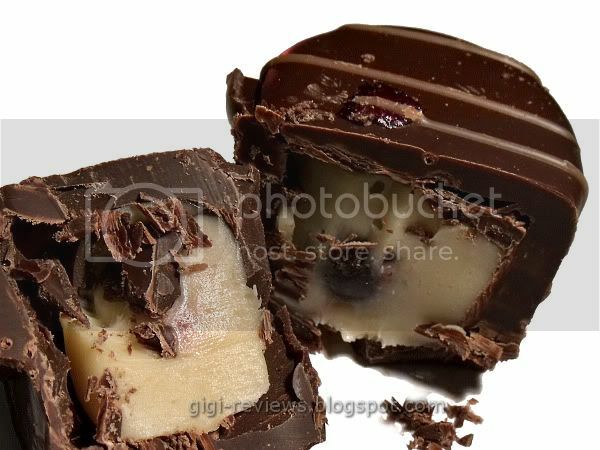 It's paired with dark chocolate. The shortbread wafer adds some crunch but no real flavor. The basic flavor is good -- it is just overwhelmingly, throat-burningly sweet. As much as I liked the taste, I couldn't finish the piece. This is the one I was most looking forward to. I love pralines (Trader Joe's sells rather large tubs of them, and they are addictive) and was intrigued by the "crispy pancake." When we here in the U.S. think of pancakes, we think about breakfast items -- large, fluffy round things, (hopefully) buttered and drizzled with syrup. However, in Hotel's world, "pancake" seems to refer to thin layers of biscuits (or sometimes wafers). I think I like Hotel's version better. They really nailed this one. It is like the best sugared pecan you will ever have in your life, coupled with milk chocolate. As best I can tell, the pancake is represented by little crunchy bits. I had been expecting more of a wafer, but this worked really well. There are no actual nuts bits in the piece, which I liked. Overall, even the pieces I didn't like as much as the praline were pretty good (Well, minus the cough syrup part). Hotel's chocolate -- both the dark and the milk -- is rich and has a fantastic melt. It's just really good all the way around. Yeah, these were good. Really, really good. Gift from Cinabar of Foodstuff Finds. Contains: Soy, nuts, gluten, sulphites, eggs. Suitable for vegetarians (but not vegans). Labels: Biscuits, Brown Sugar, Brownies, Buttercream, Butterscotch, Candy, Cherry, Chocolate, Dark Chocolate, Hotel Chocolat, Imported, Imported Candy, Milk Chocolate, Nuts, Pecan, Shortbread, U.K.
All I am going to say is that there might have been some drooling and box licking... Not that I actually did that or anything.